In the late 1800's many Dutch settled in the area as the Dutch claimed Indonesia to be part of their empire. The silversmiths in the area used to cater primarily to the Emperor and the nobility and produced some awesome silver work. 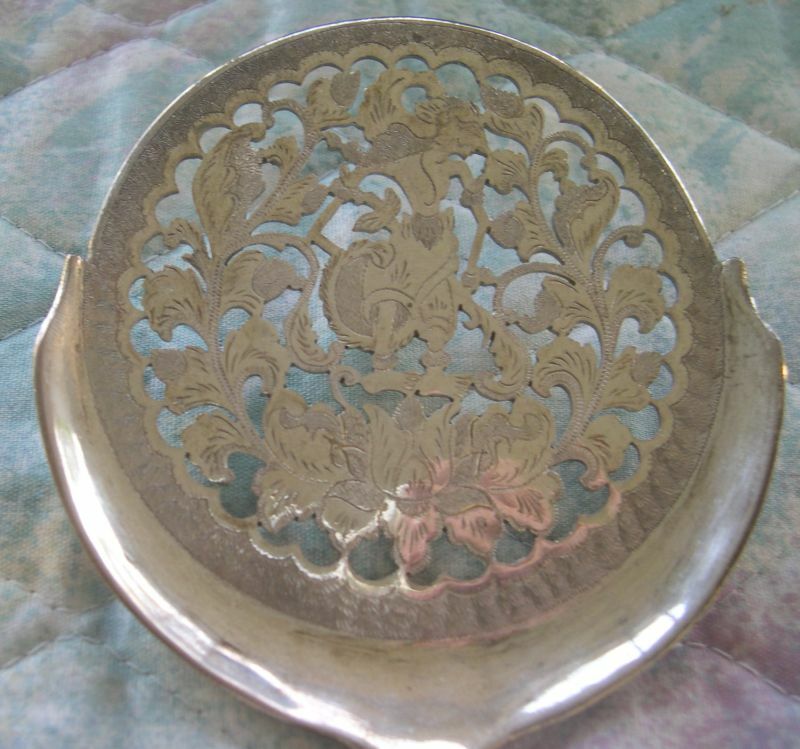 However from about 1900 to 1930 the economy of the area was very poor and the traditional customers could not afford to commission new silverwork. 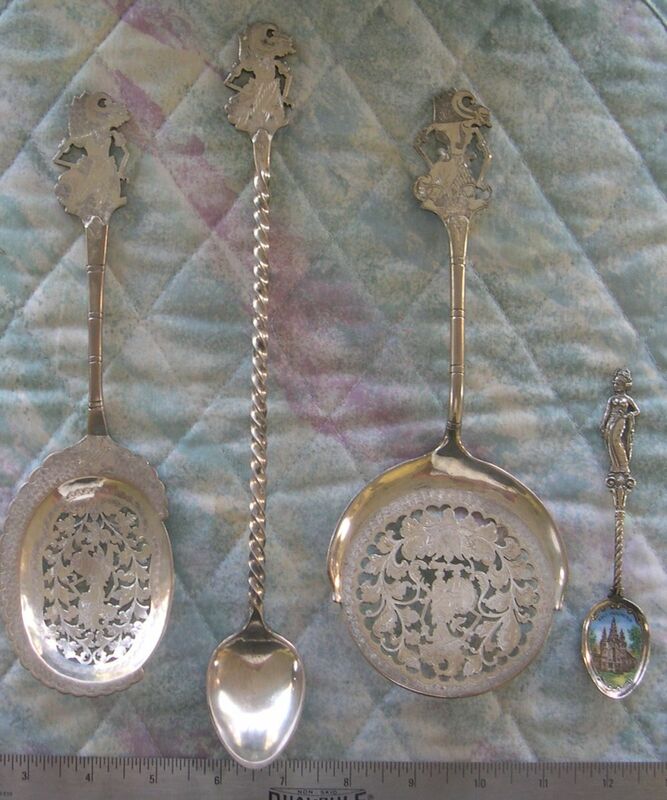 and gradually the silversmiths were able to provide silverwork more to the Dutch taste as they became the major buyers. In 1930, under the leadership of Dutch colonist, Mrs. Van Gesseler Verschuir, the remaining silversmiths created a commission to promote the silver trade and to respond to the increasing tourist trade. This was part of a broader attempt to save the traditional Java crafts under the umbrella of the Pakarjan Ngajogjakarta Foundation. The first four exhibits in this series show silver from the 1925 to 1935 era. When the silversmiths were organized, they settled on the 800 standard which was the typical central European standard rather the higher standards used by the Dutch. The purity was checked before items could be sold in the silversmith hall. As you can see these pieces are very large and very heavy. I have included a ruler at the bottom and a standard sized tea spoon on the right so you can guage size. All of the work was done by hand including the extensive engraving and very extensive cutout work. 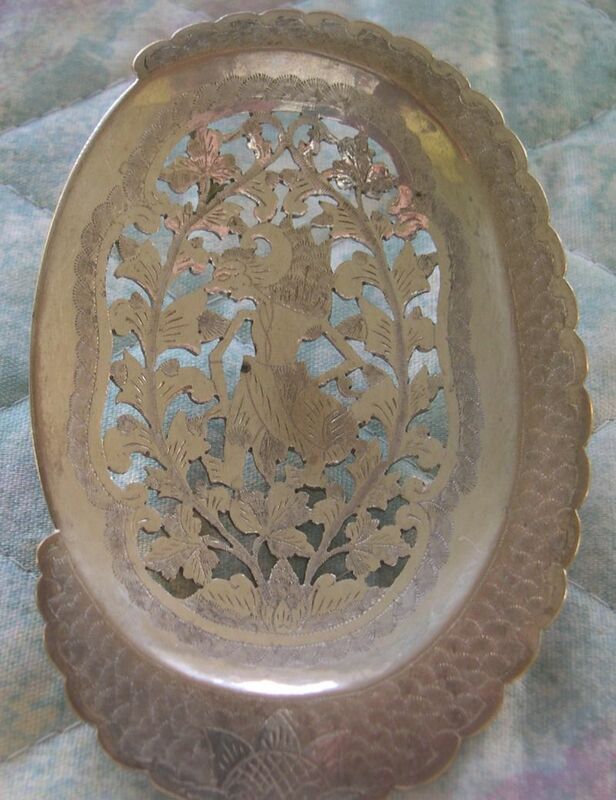 click for information on how cutout silverwork is done. right: Probably designed for serving flapjacks or associated flat type foods. Puppet finial finished on both sides. Notice the incredible amount of detail cutout work in the bowl and how the center wayang puppet is cutout to highlight the figure. I have reversed the photo so that the figure is right side up. the puppet is surrounded by traditional foilage. Again notice the large amount of cutout work and the wayang puppet is surrounded by extensive vines.